On Thursday 9th March, 2017, H.E the President Uhuru Kenyatta commissioned the construction of the Garsen-Witu-Lamu highway in Witu town, Lamu County. The 135 KM highway starting at the Garsen-Malindi junction and ending at Mokowe Jetty is the main entry point to Lamu and forms the initial evacuation of Cargo route for the Lamu Port which is currently under construction and whose 1st berth is expected to be completed and operationalized towards the end of 2018. 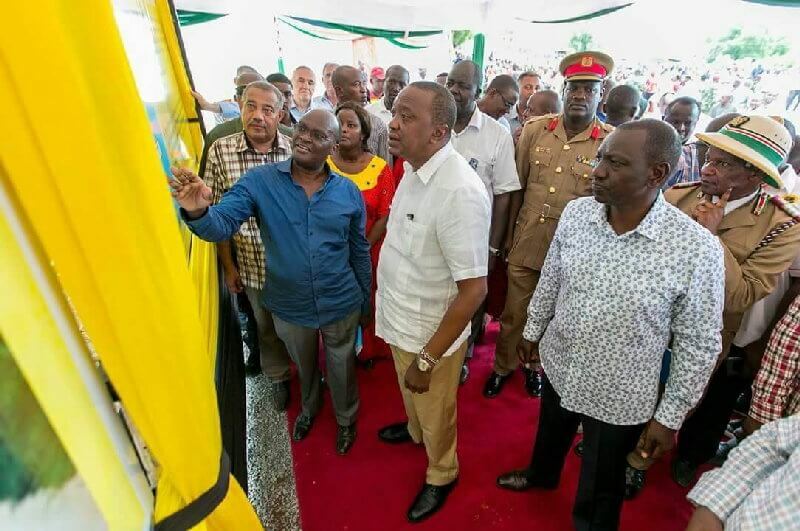 H.E The President, Uhuru Kenyatta, H.E The Deputy President, William Ruto, Minister for Transport Infrastructure, Housing & Urban Development Mr. James Macharia, LCDA Director General, Mr Silvester Kasuku, Lamu County Governor Mr Issa Timamy, during the commission of the Garsen-Witu-Lamu Highway. The completed road will open up Lamu county for more and bigger industrial and economic investment as envisioned by the LAPSSET Corridor Development Authority, through an ongoing Integrated Investment Framework for Lamu County. The massive projects that will link to this highway include the Lamu Port at Kililana, the Sh200 billion coal-fired power plant at Kwasasi and the Sh21 billion wind power project at Baharini in Mpeketoni. The road will also unlock the potential of Lamu County and boost agriculture which is the main backbone of the County as well as facilitate fisheries, livestock production, mining and the tourism Industry, greatly boosting employment. The project will boost the security situation in Lamu as well as unlock potential resources within the region.